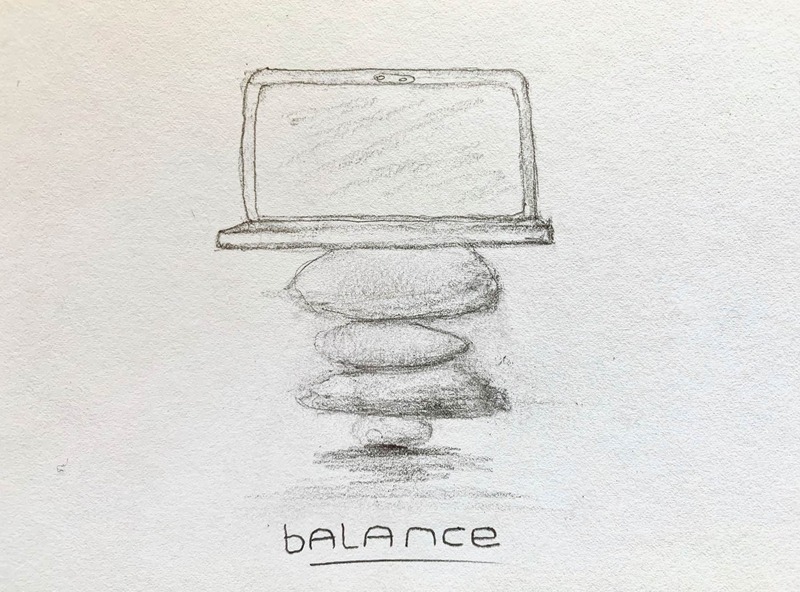 Today, my thoughts have been focused on balance. Whilst I’m feeling generally steady on my feet (dodgy knee aside) and physically able to go about my day, I’ve been more and more aware of late of the countless things that seem to throw me off balance in other aspects of life. It’s 2019, and our lives are busier and more chaotic than ever before. In a world that constantly strives to keep us connected, it is important to consider what exactly it is that we are connected to, and how that connection impacts our lives. No, I’m not talking about conspiracy theories of Wi-Fi signals stealing our thoughts and transmitting them to an evil space-demon, or of the dangers of fake news and endless influencers trying to make us believe that we need to do what they say or else be doomed. Instead, I’m thinking more about how the different connections we maintain become sources of distraction, of confusion, and of needlessly occupying thoughts. Evidently, this is not just something that bothers me, as there is a myriad of self-help books and mindfulness guides out there that try to coach us on how to get through each day without losing that sense of balance in our lives. Most of us, I feel, are aware that we need to change something about our lives at any given moment. Whether it’s the big things, like our job or our home, or smaller things like diet or exercise – there’s always someone out there telling us that we’re doing it wrong. Too many carbs, too few carbs, the wrong carbs, the wrong mix of the right carbs, or even the right carbs at the wrong time of day – and that’s just bloody carbs! As soon as you try to work out the things that really matter into your life, there’s absolutely no way that anyone can get all of these things right. And that’s reassuringly human. We are fallible, and we shouldn’t believe anyone that says they have the right balance of all these things. After all, if someone tells me that they’ve got the perfect routine and regimen for work-life balance, diet, exercise and relationships, I just ask them how much freedom that offers them. When they then realise that they can’t just drop their meticulously planned day and sit, or watch the clouds pass, or eat an ice cream in the sun, then I hope they realise the futility of it. You see, balance isn’t a static thing. In order to balance, one needs to react to the changes around us. A tightrope walker makes dozens of micro-adjustments in order to stay on the rope, and each step requires more and more, as does each gust of wind or distracting sound. In our lives, we have so many things that push us off balance that it’s easy to feel thrown around, but I am starting to think that a change in perspective is what can help us get by. Inevitably, there will be great gusts of wind in life that knock us on our arses. They tend to be things around love, money and death, and usually completely unpredictable. Inevitable, but unpredictable. And rather than seeing these storms as horrific events that will befall each of us at some point, instead we must use them to maintain perspective during the gentler times. Those breezes that swirl around us on a daily basis are exactly that – breezes. We don’t fall down when we walk in a breeze, we just take it in our stride. When it’s really windy, we lean into the wind and keep walking, not fall over and give in. Personally, I think that many of the daily breezes we feel are easily solved by simply cutting back on the needless connections. By realising that you can be happy and healthy without living on nothing but dust or protein shakes, you can enjoy eating. By seeing that you can make a comfortable living by doing your job well, rather than by competing for the top rung of some arbitrary career ladder. By spending less, rather than earning more, and buying smarter rather than working harder. A friend of mine spent £50 on various self-help books last year. The following week, she couldn’t meet us for a cup of coffee as she couldn’t afford it. Great help those books were! The noisy voices trying to tell you how to live your life are just another distraction from actually living your life. Instead of trying to stop the wind, maybe we should just keep on walking and refuse to let it blow us over.